Forgiveness Suite is another worthy rediscovery by NoBusiness Records, focusing this time on trumpeter Arthur Williams, an almost forgotten figure of the free jazz scene of the late Seventies. 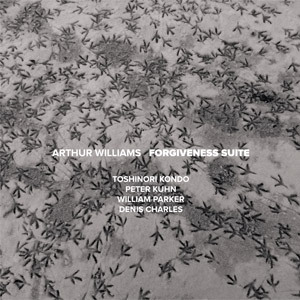 Williams participated in some interesting recording sessions of the period, like First Feeding by Jemeel Moondoc’s Muntu Ensemble, Lowe And Behold by the Frank Lowe Orchestra and most significantly ‎Peter Kuhn’s Livin' Right, that shares exactly the same instrumentation and musicians with this record. Recorded live at WKCR Radio on 19 December 1978 and comprised of a single composition roughly thirty minutes long, Forgiveness Suite is in a sense a perfect snapshot of the New York’s loft jazz scene, merging the mystical tensions of spiritual jazz and the attention to unconventional compositional strategies of Chicago’s AACM. The main theme that opens the record, after a brief introduction of the instrumental voices, is harmonically simple, with a solemn, hymn-like quality. Different other melodic cells are then heard throughout the album, usually exposed in unison lines by the trumpets; sometimes sounding like permutations and abstractions of the initial theme, or focusing on more complex rhythmic variations and structural juxtapositions. The rest of the performance is reserved to small group combinations, creating suspended interludes that highlight the different styles of the musicians. Particularly interesting is the complementary nature of the two trumpets, as evidenced in their respective solos: Kondo shows excellent technique and a rich and very controlled extended vocabulary, passing from fast legato excursions to overblowing or pedal notes with ease; Williams, though less technically refined, accumulates different ideas with a captivating, urgent attitude, alternating between a soulful, direct delivery and more adventurous ideas made of growls, half-valve notes, and a hint of multiphonics. Kuhn, here exclusively on bass clarinet, contributes with effective textural underpinnings to the ensemble passages and brief but incisive melodic statements, while Charles uses the drums to add different percussive colors, eventually returning to a more straightforward rhythmic role when needed. The episodic nature of the composition sometimes risks to stiffen the performance, but Parker, that even at this relatively early stage of his career already shows a very personal instrumental voice, effectively connects the different sections with a plethora of ideas and a firm structural understanding, both sustaining and continually pushing his bandmates to move forward, until they finally converge on a forceful collective improvisation that brilliantly closes this brief and intense album. The cd not only shares exactly the same instrumentation and musicians with this record, but also the recording date and therecording location. In other words the music hails from the same recording session. This is a vinyl release. According to the insert notes, the album was the second set of the evening - Livin' Right being the first - and is taken from WKCR's tape of the original broadcast. I only had access to the digital files so I wasn't able to check the liner notes. Having noticed the suspiciously similar dates (exactly one year apart) and the same instrumentation, I checked online and both on Discogs (No Coming No Going https://www.discogs.com/Peter-Kuhn-No-Coming-No-Going-The-Music-Of-Peter-Kuhn-1978-79/release/8570297 – Forgiveness Suite https://www.discogs.com/Arthur-Williams-Forgiveness-Suite/release/8600779) and on NoBusiness own website (NCNG http://nobusinessrecords.com/NBCD89-90.php – FS http://nobusinessrecords.com/NBLP97.php) there is the same – apparently wrong – information about the recording dates. Thanks for the clarification on the date - fixed in the review.